This USB product makes people say “This business card is a USB drive with all of your company’s marketing info on the inside? Wow!” These USB business cards are almost the same dimension as a credit card and they feature a large imprint area available for brilliant full-color printing. 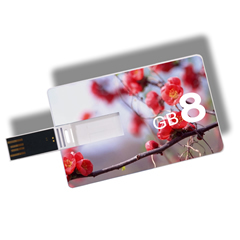 Present your USB business card, pre-loaded with your company or personal info.